This patch cable allows frequencies up to 300MHz. It performs at improved specifications, in particular in the area of alien crosstalk. 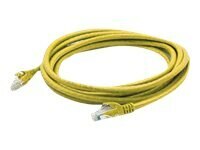 When used for 10/100/1000Base-T, the maximum allowed length of a Cat6 cable is 100 meters or 328 feet. The patch cables are 100% compliant for all of your networking needs.